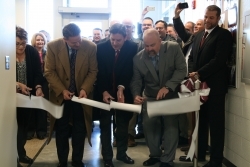 A $3.5 million expansion of Eastern Kentucky University’s Ashland, Inc. Fire and Safety Laboratory is now complete. 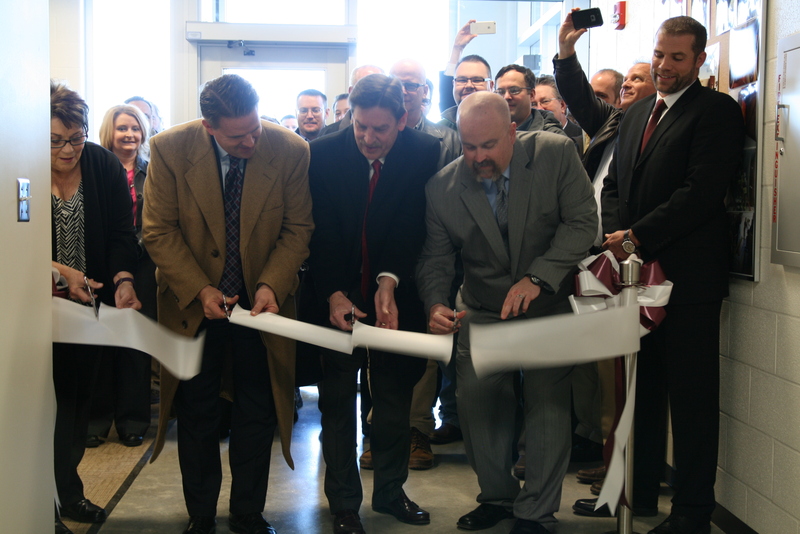 EKU President Michael Benson and College of Justice & Safety Dean Vic Kappeler were joined by faculty, students, staff and friends as they celebrated with a ribbon cutting ceremony and tours of the newly expanded facility on Wednesday, January 13, 2016. Prior to the expansion, conditions for students were pretty tight. “We were at about 110 percent capacity for used lab space,” said Corey Hanks with EKU’s College of Justice & Safety’s Fire Protection and Paramedicine Sciences department and a member of the construction management team. Two new labs, one for special hazards and one instructional lab will allow current lab space to be used more efficiently and allow for more flexibility. Originally built in 1995, the Ashland Building enlargement doubles the size of the facility. “This much needed expansion was in response to the student population in the fire sciences at the college quadrupling in size over the same period,” said Gorbett. The expansion will also provide a better location to perform additional undergraduate and graduate research, reinforce student learning outcomes by allowing more demonstrations to be conducted within the building and better enable the fire science programs to meet the high standards required by external accrediting bodies. In addition to providing better learning opportunities for online and on-campus students, the expansion will also provide the necessary facilities to host seminars for professional associations and companies, offer labs to outside organizations like insurance companies and other agencies, help provide the latest technology and instruction to improve and support education for fire related fields, expose students to potential employers and professional contacts and expand EKU’s outreach to the community. The architecture of this building was purposefully set up to use as a teaching tool with the exposure of all utilities to better demonstrate the proper placement of systems found in the built environment.